In January two members of the Victorian Commons project spoke in Oxford at the ‘From “Old Corruption” to the New Corruption?’ conference, organised jointly by Oxford Brookes and Newman Universities. This week Dr Martin Spychal takes a look at one of the themes explored in his paper – and also in his forthcoming book: science and parliamentary inquiry. During the 1830s the Whig ministries of the 2nd Earl Grey and Viscount Melbourne presided over a wide range of domestic reforms. These efforts initiated extensive changes to the electoral system, the Church, the poor laws, factory employment, local government, tithes, public health and policing. In 1836 the home secretary, Lord John Russell, explained the philosophy of the Whig reform agenda to the poor law commissioner and rising administrator, Edwin Chadwick. ‘We are endeavouring to improve our institutions’, Russell informed Chadwick, by introducing ‘system, method, science, economy, regularity, and discipline’. As part of the work for my forthcoming book I’ve been exploring the meaning and significance of science to the Whig reform agenda of the 1830s. In particular, I’ve been focusing on the role that the 1831-2 boundary commissions played in establishing a scientific approach to parliamentary inquiry and legislation. This interest was sparked by the government’s contentious assertion in 1831 that the ‘character, knowledge, and science’ of the boundary commissioners meant they could redraw the United Kingdom’s electoral map in an impartial, disinterested manner. In the early nineteenth century, science was still used as a fairly catch-all term to denote knowledge that in one way or another had been reduced to a system. Contemporaries happily spoke of military science, the science of law, politics, finance and even religion, alongside what we would think of today as the natural sciences. Science as a term, however, had much deeper cultural connotations. 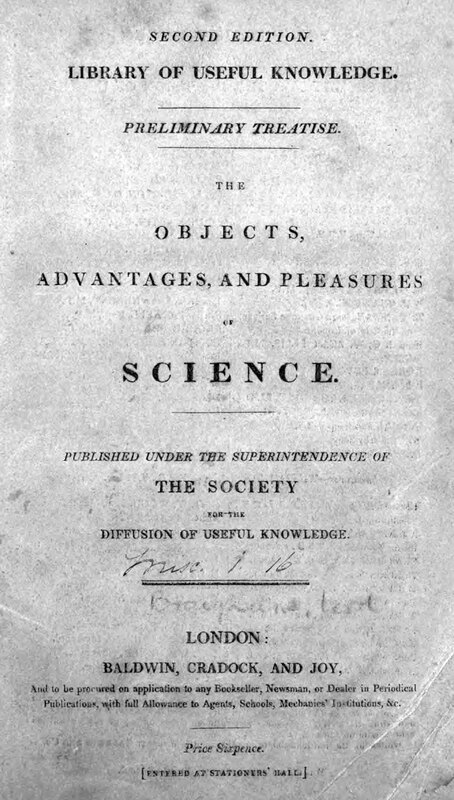 This was thanks largely to the rise of gentlemanly scientific society culture from the later 1790s, which promoted such disciplines as chemistry, geology and natural history; the influence of political economy over successive Tory ministries from 1815; and the establishment of Mechanics’ Institutes and the Society for the Diffusion of Useful Knowledge in the 1820s, which sought to expand scientific learning to the masses. 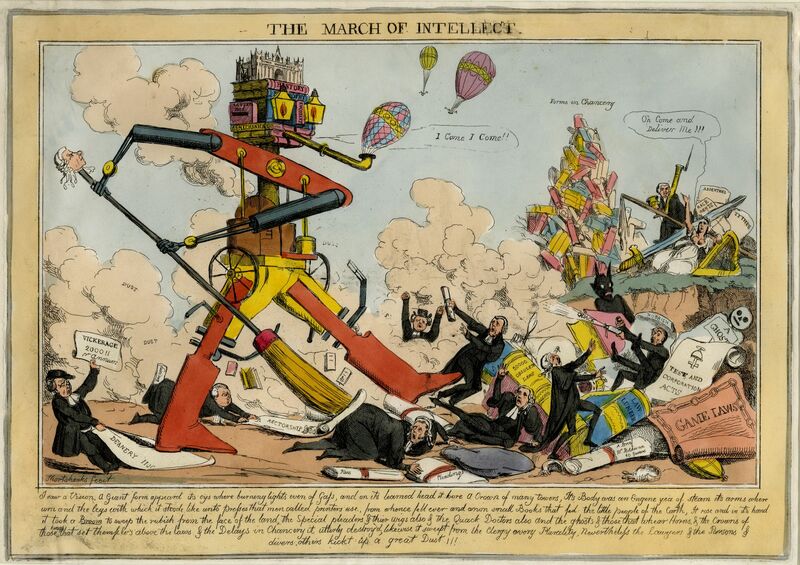 For many of the Whigs that constituted the Grey and Melbourne ministries, ‘the all conquering science’, as the Marquess of Lansdowne termed it in 1824, and its proliferation and widespread application across society, explained their sense of a march of progress, and Britain’s continuing journey to a higher plane of civilisation. This confidence in the power of science extended to Whig understandings of the possibilities of reform. Interestingly, as Joe Bord has demonstrated, Whig experience of inter-partisan cooperation at scientific societies from the 1810s led to the belief among a new generation of Whiglings, such as Lord John Russell, that similar co-operation might be possible in the political sphere. Russell reasoned that if scientific societies could further their science by ‘investigating the facts’ without troubling themselves as to what ‘theory they may confirm or validate’, why couldn’t legislators do the same thing? 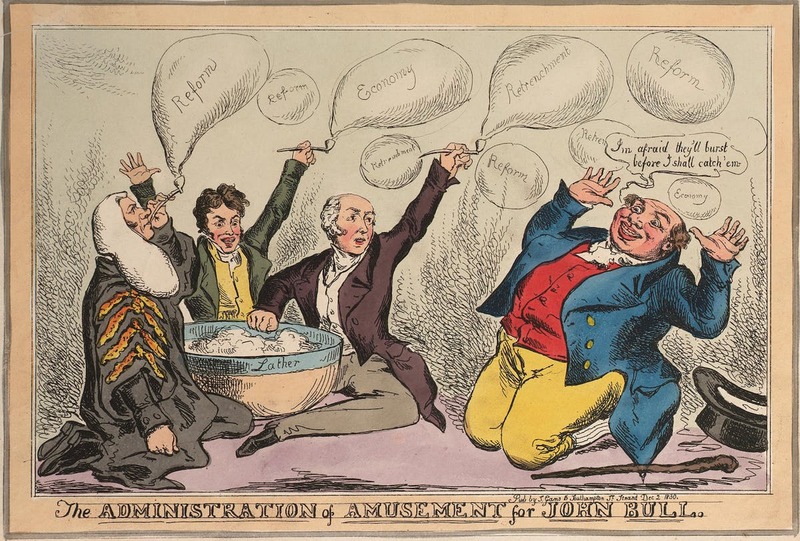 In particular, this marked out the 1820s as a period of growing enthusiasm for statistics among Whiggish and reforming legislators, and gave rise to the emerging social science movement. 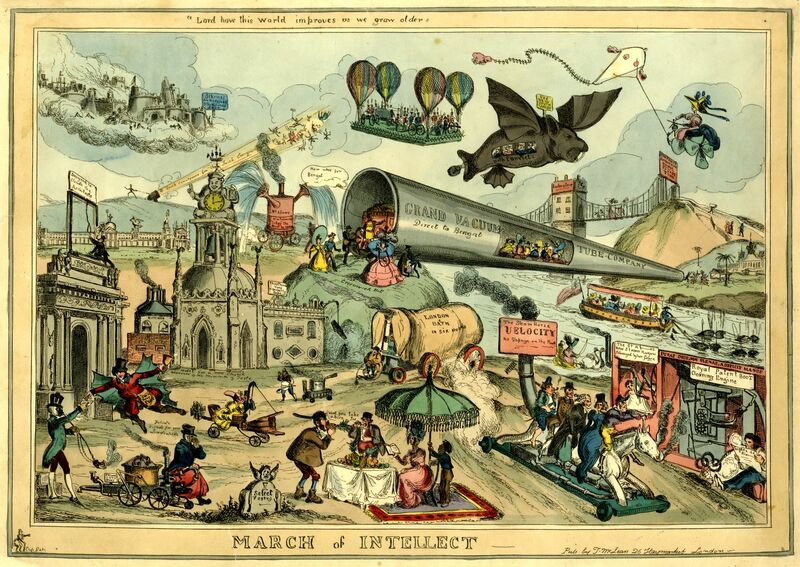 This movement prompted the formation of the Manchester and London statistical societies from 1833, who as Theodore Porter has argued, advocated the creation of a ‘science of government’ through ‘the accumulation of simple, irrefutable facts’. Until November 1830, the majority of this generation of Whigs had never experienced government. This meant that the 1831-2 boundary commissions, which were established in the summer of 1831 as part of the Grey ministry’s plans for parliamentary reform, provided the first opportunity to apply these ideas about scientific inquiry. It was an opportunity that the enigmatic and most famous contemporary Whig of them all, the Lord Chancellor, Henry Brougham, grabbed with both hands. Brougham had long been an advocate of the use of commissions of inquiry as a means of influencing a more active social legislative agenda. Nevertheless, his influence at Westminster over the past two decades had been frustrated by his difficult reputation and opposition status. Importantly, Brougham was the central figure in a circle of Whigs, reformers and political economists associated with the Society for the Diffusion of Useful Knowledge and the London University. One man from this coterie who had particularly impressed Brougham was the Royal Engineer, chemist and mathematician, Thomas Drummond. Drummond had spent most of the past decade on the Ordnance Survey in Ireland. Since 1829, however, he had been based in London, putting his training as a chemist to use in the development of lighthouse lights for Trinity House, lecturing on his work to the Royal Society, and providing public and private demonstrations (including to Brougham) of his dazzling modifications to Gurney’s limelight. Together, Brougham and Drummond devised a scheme for redrawing the United Kingdom’s electoral map that was infused with science at every step. First, they recruited commissioners, almost exclusively, from the ranks of the Society for the Diffusion of Useful Knowledge, or the Ordnance Survey. This left them with commissioners of either gentlemanly scientific ‘expertise’, or technical training in surveying and cartography. Using these men, they proposed an extensive cartographic, statistical and socio-economic investigation, which they contended would provide a neutral, disinterested analysis of each constituency’s geography and demography. The commissioners were then instructed to apply the results of this investigation to a strict set of criteria for identifying an electoral community. Here was an inductive method for defining parliamentary boundaries, which Brougham and Drummond contended, would allow for every constituency to be defined consistently across the four nations. J. Bord, Science and Whig Manners: Science and Political Style in Britain, c. 1790–1850 (2009). P. Harling, The Waning of `Old Corruption’: The Politics of Economical Reform in Britain, 1779-1846 (1996). L. Mitchell, Whig World: 1760-1837 (2005). T. Porter, The Rise of Statistical Thinking, 1820-1900 (1998). My book Mapping the state: the English boundary commission and the 1832 Reform Act is forthcoming with the Royal Historical Society. 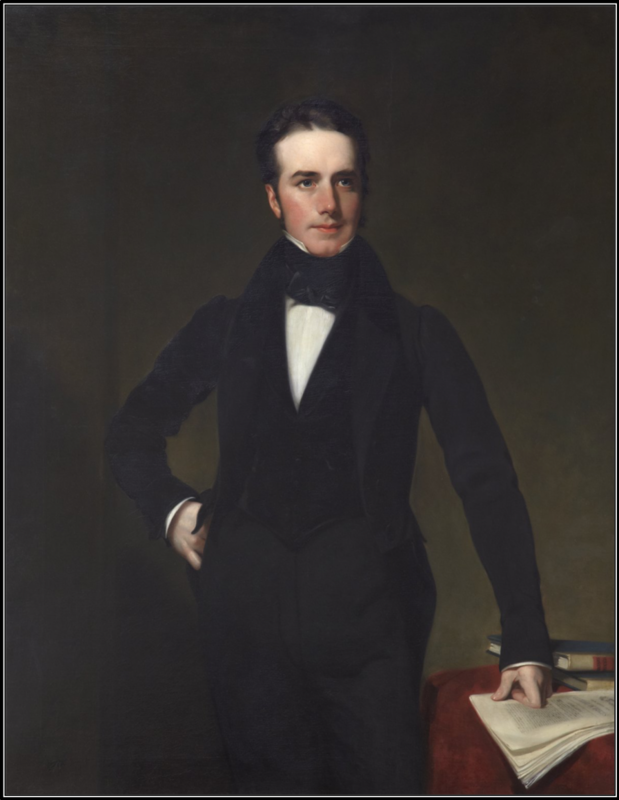 You can find out more about Drummond and the boundary commission in my earlier article, “One of the best men of business we had ever met’: Thomas Drummond, the boundary commission and the 1832 Reform Act’, Historical Research, 90, 249 (2017). This entry was posted in Conferences and seminars, Legislation and tagged 1832 Reform Act, boundary commission, Lord Brougham, science, SDUK, Thomas Drummond. Bookmark the permalink.